"It was the trip of a lifetime!" 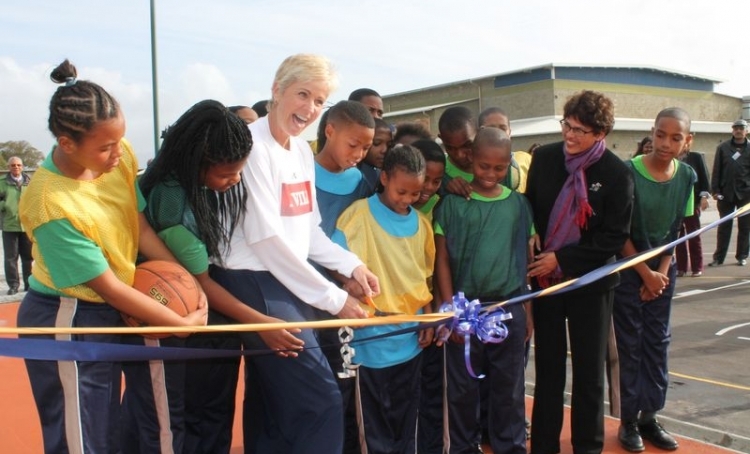 Olympic gold medal-winning basketball coach and ESPN analyst Nell Fortner helps kids dedicate new sports field at Christel House South Africa. Our supporters were simply overwhelmed. Visiting the homes of Christel House children in some of the most destitute squatter camps of Cape Town gave new perspective to the transformation taking place in these children’s lives. Among the fourteen guests traveling to South Africa with Christel House Vice President, Bobbi Bosch, were Nell Fortner, who led the American women’s basketball team to gold in the 2000 Olympic Games; Grammy-winning singer Sylvia McNair; Christel House International board member Gail Shiel and her family; ExactTarget Foundation Executive Director Karen Jung; and Christel House Academy board member Hope Hampton and her family. Nell taught the kids to play basketball on newly completed courts, with balls donated by Under Armour. The choir sang with Sylvia, and the school’s marching band performed at the sports fields dedication.